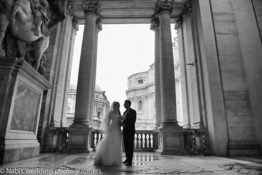 When Jessica and Gabriel contacted me the fist time, they had already clear ideas as they wanted to have their Jewish wedding in Rome. They had already in mind the venue for their Jewish wedding ceremony and for the reception. Jewish weddings in Rome are getting very fashionable. Side of the wedding day, they wanted to plan a three days event including Shabat dinner on Friday and Shabat lunch on Saturday. 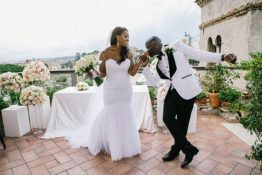 They wanted to have all their guests accommodated at the same hotel so that they could enjoy a wedding holiday in Rome all together. And so we planned for them! 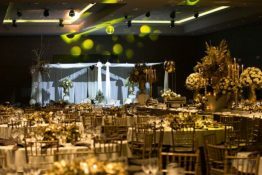 The final result was a great wedding extravaganza that all guests will remember! They decided to book a luxury hotel in Rome located few minutes from the city centre with nice big rooms where we could organise two events, a beautiful swimming pool and a 3000 mq of luxury SPA. 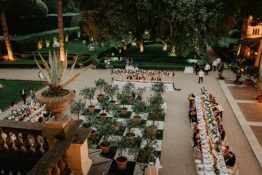 The three days wedding kermess started with the prayer in one of the room of the hotel followed by Shabat dinner in the garden of the hotel itself. Jessica chose as centrepiece decoration, a garden style candelabra with a base decorated with pink cream roses and lysianthus flowers. Second day bride and groom and their guests had their reception in the garden of the hotel, anticipated by the morning prayer, a crescendo of emotions that exploded in the most important day which was the wedding day. The day before, Jessica had her Mikvé, the traditional purity bath that has to be done by all Jewish brides to be before getting married. She had it at the Great Synagogue in Rome. Her close girl friends were present to the event. This is an important moment for all future Jewish brides since it is the last evening as free women. It has a special meaning as from the day after they will start their new life as married women. The day of the wedding was a sunny day of July and the temperature was warm but not too hot, the perfect weather for a wedding in Rome. Jessica got ready in her room with her bridesmaids and Gabriel was getting ready with its groomsmen, they were both excited and happy. Once they were ready, they both moved to the main temple of Rome: gorgeous synagogue. It was decorated with romantic compositions on Medicean vases in soft pink, white and cream. We placed some decoration both outside and inside started the synagogue on marble stands. All guests got inside the temple and Gabriel went with the two fathers to sign the Ketouba. Then it was Jessica’s turn with her father. She had a beautiful laces wedding dress and her bouquet perfectly matched the style with its white peonies, and roses. Wedding Chuppah had its 6 pillars decorated with cascades of flowers very soft and romantic, perfectly matching the style of rich synagogue. 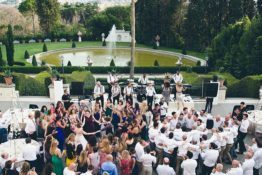 After the ceremony Gabriel and Jessica went for some pictures around Rome, Tiber river and its ancient bridges, Roman Forum, Campidoglio with the stunning landscape of rooftops and then they moved to Villa Miani for their fabulous wedding reception. In the meanwhile all guests went back to the hotel to get changed and then they all moved to the villa where they were welcomed by bride and groom. Welcome aperitif was served on the patio of the villa, right in front of the pond. There were two main buffet decorated with flowers with a large variety of delicious appetisers. Food was Kosher certified by the Rabbi of the Jewish community of Rome which is one of the oldest of the world with its strict rules. Aperitif was accompanied by some background soft music that all enjoyed and at the end of it, Maitre Riccardo invited all guests for the dinner and the big party with dances. Bride and groom hired a wonderful band called Nuit Blanche, they were coming directly from Paris. All table were richly decorated with three types of decorations, one was made with crystal candelabras with a rich decoration at the top. The second was a centrepiece made of a mirror with different types of crystal vases and bouquets of flowers in water. The third one was made of a candelabra with five flames and at the bottom small vases with flowers and candles. A mix that gave the whole arrangement an idea of movement. Very elegant! Once Gabriel and Jessica entered the ball room of the villa, the party started with lots of dances and fun. The wedding ended with sweets buffet and cocktails served on the Patio, with the landscape of Rome skyline as a background. 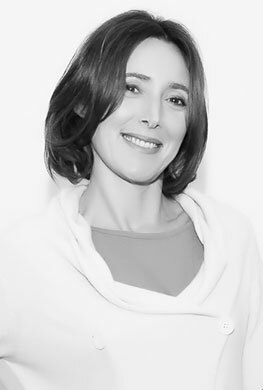 We wish to thank Alessandro Zingone for the amazing pictures.